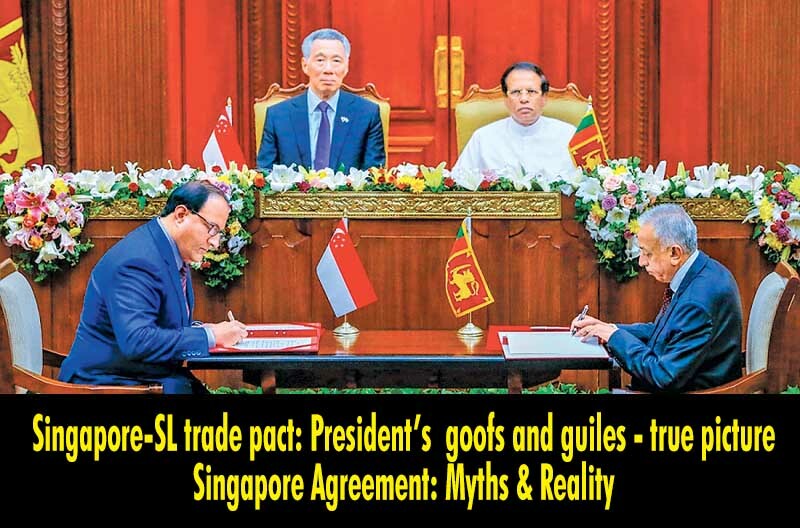 LEN - www.lankaenews.com | Singapore-SL trade pact: President’s goofs and guiles – true picture…..
(Lanka e News -25.Aug.2018, 8.00AM) Herein is the photograph which depicts the signing of an agreement –Sri Lanka -Singapore free trade agreement between the two countries when the Singapore prime minister Lee Hsieng Loon visited the Island on the 23 rd of January. The two witnesses to this were no less a person than the SL head of state president Pallewatte Gamarala and Singapore P.M. Lee Hsien Loon. The agreement was signed by SL’s development strategy and international trade minister Malik Samaraweera and Singapore’s trade and Industries minister S. Easwaran. Gamarala the chief of state however appointed a committee stating , this agreement which was signed shall be probed again with a view to make an evaluation on it. Does this mean that this Gamarala the head of state was asleep at the venue when this agreement was signed on the 23 rd and did not make an evaluation? An international agreement is signed between two countries only after a series of discussions between them and after making an evaluation of the merits and demerits of the agreement by both countries . If one of the state leaders himself after such an agreement is signed is to evaluate it , it is certainly most ludicrous and ridiculous , and it can make the other country to the agreement look upon it with suspicion. Wouldn’t this indiscretion committed by Gamarala make the Singapore investors who are planning to invest a sum of US dollars 16 billion ( over Rs. 2560,000,000.000.00 ! )and start an oil refinery as well as a steel , wheat flour and sugar Industries think twice ? In the circumstances is this action of Palewatte Gamarala as a state leader intended to be helpful or detrimental to the country ? Is he bungling or developing ? A beverage department advertisement was published in the newspapers recently in that country making mention of the evaluation committee appointed by goofy Gamarala and referring to its ‘size’. There was a strange clause incorporated in it : in future when signing agreements with SL , a guideline shall be prepared as regards the trade agreement. It is clear from this what a headless buffalo our head of state is. Several decades ago there was no open trade policy in the world. Countries signed trade pacts then according to the economic policies at that time. Those are now not tenable. Therefore countries of the world from time to time update the trade agreements signed between them . The best example is Britain. The latter is revising all the trade agreements it had signed with the European union after leaving the latter. Hence, policies cannot be formulated today to define how the trade agreements between the countries shall be prepared in the future. Gamarala’s committee being such a goofy one , via advertisements in the newspapers his idiocy and imbecility had been displayed. Obviously , this step taken by Gamarala which no sane and sensible head of state would , is not to contribute to the progress of the country but to dance to the tune of scoundrels like Padeniyas who despite belonging to a noble medical profession prefer to be on pavements staging protests and jeopardizing the lives of patients instead of duly performing their duties within the confines of the hospitals treating patients. The other reason which prompted president Gamarala’s villainous reprehensible move is , in this investment there are no illicit commission payments that are usually channeled into the open bottomless pockets of Gamarala or his wheeler dealer son in law. But for these sordid reasons , he would not appoint a so called stupid evaluation committee and expose himself as a duffer , after himself being present when the agreement was signed , and after a debate (one day) on it in parliament. Can such an atrocious action designed to scuttle the project which is going to benefit the country (not his family ) be interpreted as not traitorous ? In any event , a condensation of the Singapore trade agreement which is being prepared by development strategy and international trade ministry elucidating the true picture pertaining to the Singapore trade agreement is hereunder…. Whether it is necessary to enter into FTAs? The world around us is increasingly moving forward with regional and bilateral free trade agreements (FTAs) as the multilateral trade liberalization process led by the WTO has come to a standstill. There are now 419 regional trade agreements in the World. If we look at South Asian countries in SAARC, Sri Lanka is far behind others in working out duty free or preferential market access with other countries. In SAARC, five countries, viz. Bangladesh, Nepal, Bhutan, Maldives, and Afghanistan, by virtue of them being LDCs qualify for duty free access to the EU and Indian markets. In fact, nearly 84% of SAARC LDC exports have duty free access to the world at large. India has preferential market access to ASEAN, Japan, South Korea, by various FTAs and CEPAs it has signed during the last decade. Pakistan has FTAs with China, Malaysia and Sri Lanka and benefit from GSP‐plus in the EU market. In contrast, Sri Lanka has preferential market access only to India and Pakistan (and some preferential access to APTA members China and Korea to which Bangladesh and India also qualify). Clearly, Sri Lanka lags behind even with its South Asian neighbors in having preferential market access to its trading partners. What Sri Lanka need to do is to ensure growth and sustaining the traditional two major markets, namely the U.S. and the E.U. and negotiate Free Trade Agreements with emerging South Asia and Far East Asian countries, with the most dynamic potential trading partners in the South East Asian region, thus linking to the global production and value chains. Accordingly, Sri Lanka has embarked upon negotiations on FTAs with India, China, Singapore and Thailand. Whether the government has national policy on trade? Whether the New Trade Policy is a fake document? The Ministry observed that the trade related policy decisions are taken at different institutions under jurisdictions and following different directions. They were mostly ad-hoc and fragmented. Those decisions did not follow a clear direction. Absence of a national trade policy led to chaotic decision making and non-effective directions resulting poor performance in terms of trade. Recognizing this, the government decided to adopt a national trade policy which can bring together various policy directions demonstrated by different agencies into one platform where there is a clear vision. The trade policy was formulated through an inclusive process and it took almost one year from May 2016 to May 2017 for the preparation. As it gives a fresh outlook and a broader governing framework for the country’s trade regime and brings the unclear trade policies prevailed so far into one platform for the first time in Sri Lanka’s history, the document was named as New Trade Policy. The New Trade policy took into account development objectives of the government, Sri Lanka’s comparative advantage in trade, past trade performance, recent global trade developments and trade policy formulation experiences of other countries. The policy was prepared by two committees, a representative committee with the participation of several representatives of government agencies and later brought it to a focused paper by a group of experts headed by Dr. Sarath Rajapathirana, Economic Advisor to the H.E. the president and made it publicly available for comments. Cabinet approval was granted to the New Trade Policy (NTP) at the meeting held on 1st August 2017. The cabinet has directed the Ministry of Development Strategies & International Trade and all relevant line Ministries to take action to implement the policy measures contained in the NTP pertaining to the matters under their purview. Whether the Sri Lanka- Singapore agreement has been done secretly? SLSFTA negotiations was started on 7 July 2016 and since then 8 rounds of negotiations were held between the respective negotiation teams in about 18 months, the final negotiation held during 13-14 Nov. 2017. Negotiations were conducted by Cabinet approved National Trade Negotiation Committee and 12 of its sub committees, chaired by including all relevant public sector institutions. Over a period of 18-months, more than 20 consultations were held with a wide range of stakeholders including chambers, industry associations, professional associations etc. There were common consultations regarding all ongoing FTAs but different Sub Committees had sectoral consultations on specific to areas under each FTA with relevant Associations and Chambers. The Cabinet has kept informed on the status and the stances taken during the negotiation process. Finally, the first draft of the SLSFTA submitted to the Cabinet of Ministers on 22nd of December, 2017 and was tabled at cabinet meetings held on 02.01.2018 and 09.01.2018 along with observations submitted by H.E. the President and 14-other Cabinet of Ministers. Clearance of the Attorney General by his letter dated 15.01.2018 was obtained. Approval of the Cabinet for entering into this was given at the meeting held on 16.01.2018 and accordingly the Agreement was entered in to on 23.01.2018. However, the agreement came into force on 1st May 2018, after enactment of the bill on Anti – dumping , countervailing and safeguards. Whether tariff becomes zero for all goods immediately after this agreement? There are 7438 total tariff lines in the Goods schedule of SLSFTA. It is important to note that Sri Lanka’s 50% tariff lines (3719 items) are already duty free, except for a few not only to Singapore but for any other country. The Tariff Liberalization Program (TLP) of SLSFTA was done in consultation and with the agreement of the Ministry of Finance and Mass Media because it has to be carefully designed to have the least impact on domestic industry and revenue collection. Under SLSFTA, Sri Lanka undertook (“TLP”) to liberalize upto 80% of its tariff lines over a period of 12 years to 15 years. As said in the beginning, Sri Lanka’s 50% of Tariff Lines will be immediately liberalized when Agreement comes into force as those 3719 tariff lines except for a few are already duty free. Consequently, it will not have any impact either on revenue or domestic industries. The rest of the tariff reduction and elimination will be a gradual process i.e 15% of Tariff Lines (1116 items) from the 1st to 6th year in equal instalments, next 14.3% of Tariff Lines (1064 items) from the 7th to the 12th year in equal instalments and 0.7% (51 items) from the 11th to the 15th year. Therefore, all tariff lines of all goods will not become “zero” immediately on enter into force of the agreement. Whether domestic industries are at a threat because of this agreement? Almost all FTAs signed by Singapore with its other trading partners, the level of liberalization is kept close to 90% or more of the tariff lines. Sri Lanka, in comparison, has been able to negotiate to limit it to 80%, thereby keeping 20% of tariff lines i.e. 1487 items in the Negative List to protect domestic Industries and revenue concerns. Items like footwear, confectionery and many other sensitive items which has a high MFN tariff have been kept in the negative list due to domestic sensitivities though one can argue that keeping them in the negative list does not benefit larger segment of consumers. Furthermore, bilateral safeguard section under the trade remedies chapter of the agreement has provision to increase tariff to the MFN level, if import surges take place on a particular product due to implementation of the trade liberalization programme and if such imports cause injury or threaten to cause injury to domestic industry. Therefore, there are provisions in the agreement to protect the domestic industries. In addition, mere reduction of tariff will not enable products to be imported, since the products to be imported from Singapore, should meet the rules of origin criteria. Furthermore, products imported will also be subject to import license requirement, if applicable, and also to regulations for protection of human, animal and plant life. Can the products of other country (like India, Malasiya, Indonesia etc.) origin come to SL under SLAFTA? The SLSFTA stipulates that there should be a minimum of 35% value addition or change of Tariff Headings at 4-digit level to ensure that a substantial value addition or processing is taken place within Singapore. Sri Lanka has not accepted ASEAN cumulation proposed by Singapore. Therefore, inputs originating in member countries of ASEAN will not qualify for tariff concessions unless 35% value addition or change of tariff heading at 4 digit level has taken place in Singapore. Furthermore, under the Rules of Origin criteria, products imported from Singapore will not qualify for tariff concessions unless 35% Value addition or change of Tariff Heading take place at four-digit level in Singapore. The Rules of Origin in the Agreement will therefore not allow goods simply to be exported through Singapore or entroport trade, since minimum value addition or processing has to necessarily take place in Singapore. Is there any major impact on government revenue? There will be little or no impact from the immediate list since 50% tariff lines (3719 items) are already duty free. Import data on products imported from Singapore will show that out of total imports of US $ 1293 million in 2017, US $ 750 million were petroleum and related products (in fact amounting to 60% of imports from Singapore) and US $ 228 million were gold. Although gold is under duty free list imposition of excise duty will protect revenue. Since tariffs on petroleum products, tobacco, spirits and alcohol are an important revenue source to the government, these items have been retained in the Negative List (products that will not be subject to liberalization), thereby protecting revenue. It should be noted that as liberalization of tariff will take place over 12 to 15-year period, revenue loss, if any, should be calculated yearly basis and not as if tariff on all items are reduced immediately. According to the Ministry of Finance, total customs revenue collection from imports from Singapore in 2017 was Rs.35 Billion and revenue loss consequent to tariff liberalization under the Singapore agreement over the entire period of 15 years Sri Lanka is Rs.733 Million. Therefore average annual revenue loss is Rs.49 Million. Furthermore, Finance Ministry analysis shows that 97.79% revenue is protected. Whether the domestic producers will badly affect through flooding of cheap products? Such a situation is prevented through the new legislation on Trade Remedies that the parliament approved recently. In addition, the Agreement also contains a Chapter on Trade Remedies which cover anti-dumping, countervailing and subsidies, , global safeguards and bi-lateral safe guard measures. Since Sri Lanka has enacted legislation on trade remedies in March 2018, Sri Lanka is now in a position to take legal action if dumping take place, or subsidies are granted by Singapore, to counter them. In addition, bi-lateral safeguards can be applied during the implementation period of the TLP if increased imports from Singapore due to tariff reduction causing injury to domestic industry. These provisions will enable Sri Lanka to apply such measures, if need arises, when the SSLFTA is implemented. Is it allowed to import harmful products such as garbage, clinical waste, nuclear waste, chemical waste etc. through SLSFTA? Some argue that since waste products are included in the TLP, such items can be dumped into the country under the agreement. It needs to be emphasized that reduction or elimination of tariff automatically does not grant automatic entry of a product into the country . For all products imported into the country, , domestic regulations and mechanisms and applicable import licensing requirement, applicable standards, regulations applicable to protect plant, human and animal life will apply. This agreement does not take away Sri Lanka’s rights under International Environmental Protection Treaties to which Sri Lanka is a signatory. Therefore, the current environmental laws and regulations will apply to such products and therefore this agreement has no exemption for those to enter to the country. Under the Article 20 on “General Exceptions” of GATT 1994, Sri Lanka has right to take measures to protect human, animal and plant life or health. This provision has been incorporated into article 17.7 of the agreement which ensure this right. Therefore, if there is a need, such measures can be introduced in the future. Will the agreement affect Biodiversity of Sri Lanka? It is alleged that this agreement will affect the Fauna and flora of the country as endangered species such as elephant, reptiles etc. could be exported to Singapore and such animals could also be imported from Singapore. It should be mentioned that Sri Lanka is a signatory to Convention on International Trade in Endangered Species of Wild Fauna and Flora (CITES) and Convention on Biological Diversity and the agreement does not take away our rights under these two conventions or under any other relevant conventions. Such imports and exports will be subject to domestic regulations and mechanisms implemented under such conventions which include licensing requirement and recommendation and approval of the relevant designated government agency. Why such harmful products are included in the duty free list? In any international Free Trade Agreement, it is necessary to include all tariff lines that is 7438 in the goods schedule that is either in the negative list, immediate liberalization list or phasing out list and a tariff line cannot be excluded. Therefore, such products should be in any one of the lists. Sri Lanka choose, inclusion of these items in the TLP of 80% as it gave flexibility for Sri Lanka to include domestically sensitive more items in the negative list, because such harmful items cannot be imported anyway without obliging the local laws. This is not the first time that these items are brought under the duty-free list. Most of these items have been included in the duty free list in the Indo-Sri Lanka Agreement and Pakistan-Sri Lanka Agreements and there is no evidence to suggest that these products are coming in to the country in any harmful manner. However, such items cannot enter the country because environmental laws and regulations, import licensing requirements will apply to them. Therefore, it is not something that has been granted to Singapore only. Why importation of paddy kept duty free after 12 years in the agreement resulting our food security at a threat? In the case of items like paddy, grains, wheat the applicable rules of origin is criteria of “wholly obtained”. The wholly obtained product should be obtained from the soil of the country that is in Singapore. If such agricultural items like wheat, paddy and other grain if not “wholly obtained” within Singapore such products would not qualify for duty free entry even such products are in the free list. And there are no paddy fields in Singapore to obtain such product from Singapore soil. It is alleged that rice from Pakistan, Thailand and Vietnam could be channel through Singapore. In the first place rice is in the negative list and therefore, the question does not arise rice being imported through Singapore. Whether the agreement makes any commitment to liberalize services? Both Sri Lanka and Singapore decided that the SLSFTA should be limited only to business visitors and intra-corporate transferees. Therefore, the agreement completely excludes any independent movement of natural persons (ie. Excludes Contractual Service Suppliers and Independent Professionals). Accordingly, Sri Lanka’s commitments in trade in services are limited to within the existing level of openness in Sri Lanka’s current legal and regulatory framework. As per prevailing exchange control laws, mode 1 (cross boarder supply) and mode 2 (consumption abroad) are by and large open for market access. Accordingly, as per Sri Lanka’s commitments in scheduled sectors Sri Lanka places no restrictions in market access for mode 1 and mode 2. Thus staying in line with prevailing level of liberalization and the SLSFTA offers no new market access in this regard. In mode 3 (Commercial presence or Investment) as well, Sri Lanka’s commitments under the SLSFTA do not in any cases go beyond the prevailing level of openness offered through the Foreign Exchange Management Act of 2017. In fact, in some cases such as construction services, the existing regulations allow 100% foreign equity ownership, but the SLSFTA makes a commitment only up to 40% foreign equity ownership. Therefore, with regard to services provided through investment as well, the SLSFTA provides no new liberalization but stays within the existing level of openness allowed through prevailing legislation and regulations. In Mode 4 (movement of natural persons), Sri Lanka has made limited commitments only in business visitors and intra-corporate transferees in a few sectors and movement of independent professionals is not liberalized or allowed Here again the key priority is in supporting measures to attract investment to Sri Lanka. Any company that makes a significant investment overseas would like to have its senior management to accompany that investment to ensure that the investment provides the desired results. Accordingly, in selected sectors Sri Lanka has made commitments for intra-corporate transferees of senior management. These senior management categories are defined as Managers, Executives, and Specialists. Each category has a clear definition in the Agreement. For example, an executive is an employee who is either a director of the company or receives only limited supervision from the general body of shareholders. Therefore, intra-corporate transferees of defined senior management linked to investment are allowed in the following sectors (IT, financial services, subsectors of maritime services (repair and rental services), construction industry (where a Sri Lankan company would have a majority ownership), hotels and restaurants, travel agency (where a Sri Lankan company would have a majority ownership), advertising, technical testing services, and sports events organization. Such senior management intra-corporate transferees are subject to all immigrations laws and regulations. They must also have at least 5 year experience in relevant industry or professional field. The initial period of work will be up to 2 years which can be extended up to a maximum period of 5 years subject to approval by the controller of immigration. Furthermore, corporate transferees appointed to senior management positions should work in the same company to which they are transferred and cannot move to work in another company. As per current laws and regulations, BoI approved companies can bring in project personnel allowing 2 year visas for directors, and private companies can bring in foreign employees where skill shortages exist with line ministry approval. Given the stringent definitions of senior management categories within intra-corporate transferees, it is likely that Singaporean companies will only transfer the most required and important categories of employees to a Sri Lankan branch/subsidiary. Considering the significant wage gaps between Sri Lanka and Singapore – it is highly unlikely that these employees will come to Sri Lanka and undercut Sri Lankan wages and take Sri Lankan jobs. Does the Singapore FTA open up professional services? The short answer is no. Sri Lanka’s commitments in professional services are limited to mode 1 and mode 2. That too in sub-sectors of selected professional services which were requested to support Singaporean investments into Sri Lanka. Mode 4 and Mode 3 are not liberalized to any extent in these professional services – thus there is no provision for Singaporean professionals to come and work in Sri Lanka under the SLSFTA. Accordingly, Sri Lanka made commitments in Mode 1 and Mode 2 in legal advisory services excluding Sri Lankan law, provided cross-border – therefore this excludes the practice of Sri Lankan law. Mode 3 and Mode 4 are “Unbound” meaning no liberalization or commitments by Sri Lanka. In engineering services Sri Lankan made commitments in Mode 1 and Mode 2 in the advisory and consultative services sub-sector – this again does not include the practice of engineering, but is only advisory and consultative services provided cross-border. Mode 3 and Mode 4 are “Unbound” meaning no liberalization or commitments by Sri Lanka. In architectural services Sri Lanka made commitments in Mode 1 and Mode 2 in the pre-design advisory and consultative services sub-sector – this again does not include practice of architecture, but is only for advisory services provided cross-border. Mode 3 and Mode 4 are “Unbound” meaning no liberalization or commitments by Sri Lanka. Does the Singapore FTA allow non-nationals of Singapore to take advantage of the FTA and enter Sri Lanka? In the SLSFTA Singapore defines a “National” as a citizen of Singapore or a Permanent Resident of Singapore. Singapore has a population of 5.6 million people and the number of Permanent Residents is 0.53 million as of 2017. Obtaining PR in Singapore is a long and stringent process, subject to more challenging requirements in recent years. It is only this cohort of Singapore Nationals that can benefit from the FTA, and all other nationalities are excluded from the FTA. It is highly unlikely that someone who has with difficulty obtained Singapore PR and earning Singaporean wages would try to sneak in to Sri Lanka and take Sri Lankan jobs using the FTA as a conduit. Even if a Singapore National is allowed to arrive as a corporate transferee, will be subject to limitations of 5 years of relevant industry or professional experience, period of visa initially for 2 years which can be extended to maximum period of 5 years and cannot move to work in another company and could work only in the company to which he/she was transferred. Does the Singapore FTA enable manpower and recruitment services companies to bring down all manner of workers from anywhere in the world? Sri Lanka’s offer in “Placement and Supply of Personnel” is limited to Modes 1, 2, and 3. This means a Singaporean recruitment services company could set up a company in Sri Lanka. This is already possible under prevailing laws and regulations. Sri Lanka’s commitment in this sector does not include Mode 4 in any capacity – it is completely unbound. Unlike in other Mode 4 commitments, there is no reference even for senior management personnel for such recruitment companies. Therefore, a Singaporean recruitment company can set up an office in Sri Lanka, as is already allowed in the current legal structure, but it cannot recruit personnel from abroad since mode 4 is unbound. Any such recruitment company that wishes to hire work from overseas has to go through the regular processes of immigration, line ministry approvals – the current laws and regulations prevail and the FTA creates no new liberalisation in this regard. In fact Singapore has also made a commitment in “Placement and Supply of Personnel” covering mode 1, 2, 3, and in mode 4 for business visitors and intra-corporate transferees. Singapore’s commitment has gone beyond Sri Lanka’s commitment in that it makes some commitment in Mode 4 whereas Sri Lanka leaves Mode 4 completely unbound. Singapore’s commitment in this sector does not mean that a Sri Lankan company can recruit workers from anywhere in the world to freely work in Singapore.